See one of the finest volcanic calderas in the world, the caldera of Mount Batur. Relaxing in the natural hot-water spring in Mount Batur. Visit the ancient holy temple of Tirta Empul. Travel to Tegenungan & Munduk waterfalls. Pickup and drop-off services provided. Visit a coffee plantation in Bali, drink the most expensive coffee in the world. Explore Celuk, Mas and Topati villages, known for their craftsmen. Raft on the Ayung River. Enjoy a generous buffet lunch. See the residents simians of the Ubud Monkey Forest. Visit Tanah Lot, home to an ancient Hindu temple. Enjoy a beautiful sunset view from Tanah Lot. A holiday in Ubud is your chance to explore the cultural, artistic and spiritual heart of Bali. This mystical place is known for its lush terraced rice fields, awe-inspiring temples and a complete dedication to arts and culture. There is no better way to immerse yourself in the colorful world of Bali’s centuries-old traditions than to book a trip to Ubud. Neka Art Museum is an architecturally exquisite spot where you can acquaint yourself with Balinese and Indonesian art. This cultural venue hosts work by many of the most prominent Balinese artists. Goa Gajah, or the Elephant Cave Temple, is one of the most intriguing religious sites in Ubud. 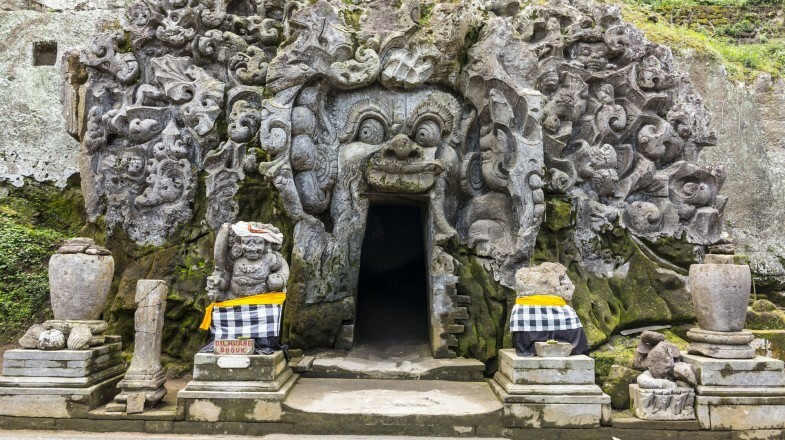 Located about 2 kilometres from the center of town, Goa Gajah is known for its slightly ominous entrance, which is carved to resemble the gaping mouth of a demonic creature. Ubud Monkey Forest is one of the town’s most popular attractions and a place where you will find many playful macaques and several stunning Hindu temples. Tegalalang rice terrace is nestled on the outskirts of Ubud. This picture-perfect spot is famous for the cascading green rice terraces and lush vegetation. Ubud is known for its many yoga and meditation centers. If you are looking for a place to practice mindfulness or master your asanas, head over to your nearest yoga studio and you will be able to find a workshop or course suited to your level. The center of Ubud is best explored on foot, but if you want to go further afield you can do so by catching a bemo, Bali’s ubiquitous mini-bus. In the evenings, make sure to catch one of Bali’s famous dance performances. Most popular ones take place in front of the Ubud Palace, although there are a number of venues that host them on a nightly basis.